Now that ATi has released the X800 Series cards (and nVidia their 6800 Series), the 9800 Pros aren’t at the top of the heap anymore. Pros w/ the 256 bit memory), and a 9800 Pro 256 for well under $250 USD. The 9600 Pros, which were ranging around $160 when I reviewed one, are dropping closer to $100 by the day. During reviewing that 9600 Pro (and the 9600XT shortly thereafter), I found it (them) to be very admirable performer(s). So, with the price dropping as low as it is, and still running a GeForce 4 Ti4200 128MB (4x AGP) card myself, I decided it was high time to do something about upgrading to something newer. I did some research on makes, models, onboard ram, overclocking, benchmarking, and finally settled on Sapphire’s product seen here today. model. They also carry the “OEM” model which includes fewer extras, but costs a good deal less moeny. One other item I considered while shopping, and this swayed my choice a good deal, was that this model was reported to be shipping with the R360 (9800XT GPU) core. that was flashed onto them by Sapphire. While I intend on covering the procedure for flashing this card into an XT in another article, I will say it went flawlessly, and technically I now own a 9800XT. Today however, we’ll look at the card as it’s shipped. I’ll then run it through the paces I had run the 9600’s previously, to see how much of an increase in the benchmark scores there is. New SMARTSHADER ™ 2.1 technology allows users to experience complex, movie-quality effects in next-generation 3D games and applications. SMOOTHVISION ™ 2.1 technology enhances image quality by removing jagged edges and bringing out fine texture detail, without compromising performance. 128-bit floating-point color precision allows for a greater range of colors and brightness. Unique VIDEOSHADER ™ engine uses programmable pixel shaders to accelerate video processing and provide better-looking visuals. ATI’s new FULLSTREAM ™ technology removes blocky artifacts from Streaming and Internet video and provides sharper image quality. Included for software is the usual driver disk, Redline overclocking utility disk, PowerDVD 5, and a full copy of Tomb Raider Angel of Darkness. Tucked into the driver disk envelope was the usual “Fueled By Sapphire” case badge. notoriously hot, and this piece is adequate at default speeds. If you start overclocking the GPU, things get very hot, very fast. the future article planned goes much further indepth. (no pun intended) in the Video Cards/ATI Topic here at OC-Forums. A search here will find many different ideas for aftermarket and user modified cooling solutions. Note also in the picture above; If you plan on installing ramsinks, the OEM cooler overhangs the memory chips slightly. 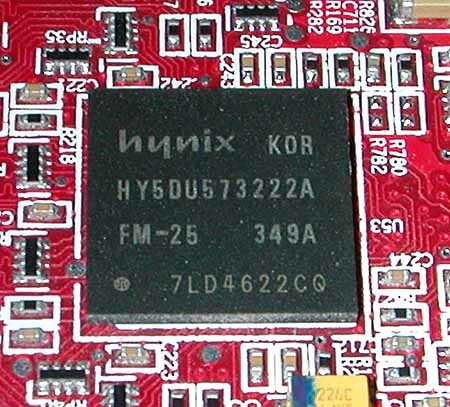 You’ll need to find another HSF to use that does not cover the Hynix chips first before you can add ramsinks to them. Business as usual on the backside of the card. I’ve yet to test out an ATI card that had clearance issues with the ram slots, and this is no exception. With the OEM HSF in place, you won’t lose any PCI access below the card either. However, given the temperatures this card runs at, it might be best to leave at least two (if you can) slots open below it, to allow as much air to get into the HSF as possible. on a reboot, the BIOS screen would appear, and then the video would cut out. I would then have to shut down, turn off the power at the PSU, wait a few seconds, and restart the machine. Every ATI card I’ve tested (coincidentally, all of them have been Sapphire products) have done this. If someone could e-mail me with a reason this does this, I’d be very grateful. I cannot find any answers anywhere to why they do this. I’m currently building a pair of PC’s for a local company, and both of the cards in them (Sapphire 9600 Pros) do this as well. For these tests I was running Windows XP Pro SP1a, and using ATI Catalyst 4.4 drivers. 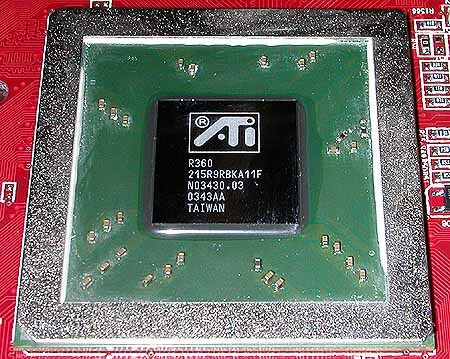 (412MHz core, 730MHz memory (365MHz DDR)). All benchmarking was done at 1024 x 768, 75 Hz. The default settings were used with each individual program. I was able to get the clock speeds higher on the 9800 Pro, especially after replacing the HSF with an Arctic Cooling VGA Silencer. 3D Mark 2001SE and 2003 respectively. I also got well into the 49,000’s in Aquamark 3 at those speeds, but have yet to break 50K in that one. Upgrading from a GeForce 4 Ti4200 to this card was a giant step up in graphics for my system. I was not only able to run at a much higher screen resolution, but use AA and AF as well. AF versus the Ti4200 and AA/AF disabled. Comparatively, with the 9800 Pro, I get roughly equal framerates to the latter (Ti 4200, 1024 x 768, no AA or AF) running 1280 x 1024 with 6x AA and 8x AF. The Ti4200 would barely run this resolution with AA/AF disabled. The difference visually between the two at 1024 x 768 is amazing. The framerates the 9800 Pro gets at 1024 x 768 with AA/AF disabled is mindboggling. This is one fast piece of silicon. Upgrading video cards right now is a difficult decision. Jump now, and get some decent hardware for reasonable money, or hold out and upgrade the entire system with PCI Express. breaking 12,000 Marks, some breaking 13,000 with the newest cards. With prices coming down on the 9×00 cards, now is a great time to upgrade for those still running older models than these if waiting for PCI Express isn’t an option. All in all, I’ve been quite happy with this card so far. I’ve got no problem waiting a while for PCI Express to mature, and this gets me back in the game until then.